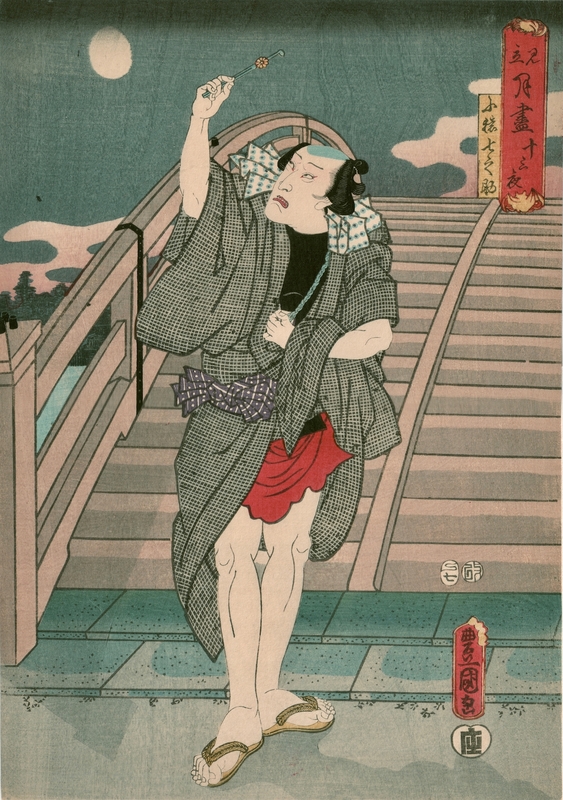 Utagawa Kunisada/Toyokuni III (1786-1865) Parody of Scenes in Moonlight (Mitate Tsuki zu Kushi): Gibbous Moon, 1857. Oban. A companion to the previous piece from this series, this print illustrates the actor Ichikawa Kodanji IV as Kozaru Shichinosuke. The scene is taken from the play of the same name which is so famous as to be a slang expression in modern Japan to suggest dishonesty. The scene is from act II of the play set at Eitai Bridge. Shichinosuke has been dozing near the river. He is nicknamed Kozaru Shichinosuke, which literally means "Little Monkey" Shichinosuke, as he is a skilled thief. He sees the beautiful maid Takigawa passing by with two men in attendance. She is engaged to the shopkeeper Yoshiro. Shichinosuke spots the fine silver ornament in Takigawa's hair. He immediately plans to steal it and is struck by her beauty. When the strap of Takigawa's slipper breaks, her two attendants compete for the honour of fixing it. This incident gives Shichinosuke the opportunity to stealthily steal the hair ornament. Takigawa notices that her silver ornament is missing. Her two attendants are ready to go off in search of the thief but she tells them that they should all go back to the mansion. When they have gone, Shichinosuke comes out of hiding, holding Takigawa's hair ornament up to the moonlight. This is the scene we have here… Shichinosuke standing at the entrance to Eitai Bridge holding in his hand the hair ornament of Takigawa under the moon. The play is long and complicated - the whole plot can be read here on the excellent website kabuki21. The play and the character are famous in Japan. The print is a delightful and subtle near monochrome. A very lovely Kunisada, colour condition and impression are all fine.